535 years ago today, the world was graced with the arrival of Michelangelo di Lodovico Buonarroti Simoni. He was born to what would now be a middle class family in Caprese, in the region of Tuscany. 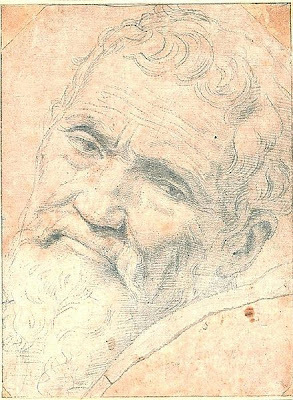 No one could have known at the time, but Michelangelo and his peers would change the course of human history. The body of work and thought left behind by these men is staggering. His David is arguably his most famous and lasting work, but it's not possible to spend any time in Italy without seeing his footprints. 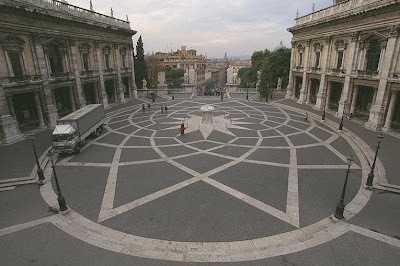 My favorite Michelangelo project is the Campidoglio in Rome. The Campidoglio is a Piazza that marks the spot where ancient Rome was founded and where it's governed today. 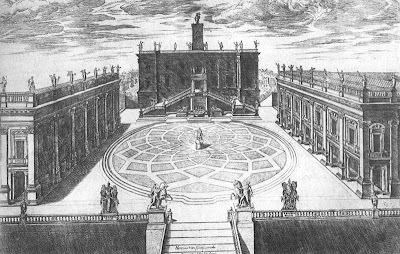 The Campidoglio is a sloping trapezoid and Michelangelo pulled off an incredible act of forced perspective when he designed the piazza. This is an engraving from 1568 by Étienne Dupérac that shows Michelangelo's solution. Everything hinged on the shape of the pavement. The spoked Easter egg at the center makes the piazza appear to be perfectly rectangular. Like everything from the Renaissance, the shape he designed was rife with symbolism. It's said to allude to the constellations though what it really represents will never be known. 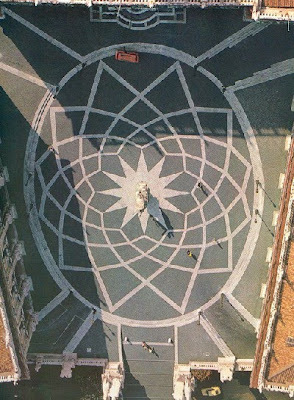 Pope Paul III, who commissioned it, was sufficiently suspicious of the motives behind the shape that the pavement wasn't completed until 1940. So happy birthday sir. I for one am thrilled that you once walked the earth. I have a sneaky feeling I'm not alone in that. wow . i love everything about this . 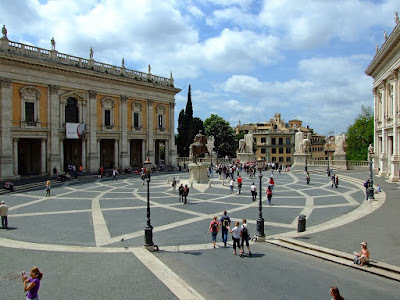 have you been to the Campidoglio? It'll change your life! no :( and i believe it! of all the times I've been to Italy for designy things I've never been south of Bolonga! And I'll even be in Milan in less than two weeks for ExpoBagno - i really really would like to see this piece of work though.. i'm a big believer in the science of art, like fibonacci sequence and the whole 'golden rule' theory of design.. this has MANY of those elements.. he really was a master for a reason.. do you know what part of it wasn't finished until modern times? i wonder if it hints at what was so unacceptable about it by catholic church.. thanks for the art history refresher too! Oh then you have to have to have to jump on a train and go to Rome. You would not believe the mastery that is Bernini's St. Peter's Square. If you ever go, let me know. Bernini buried an illusion in St. Peter's Square that about gave me a stroke when I saw it. The pavement is what was never completed until the 20th century. The shapes he used to force his perspective had pagan roots and it weirded everybody out. Funny you should mention fibonacci sequences and golden rations. My new logo (which is still being designed) has a golden ratio in the middle of it. Art is science and science is art!